The very thought of getting a root canal puts most people on edge. But have no fear— Morgan & Haupt Dentistry utilizes the latest technology and technique, combined with nitrous oxide (laughing gas) to make your root canal a virtually pain-free and low-stress procedure. The term “root canal” refers to the natural cavity at the center of the tooth. The tooth’s nerve is located in soft tissue (pulp) inside the root canal. If the tooth is damaged either by trauma or decay, debris can enter the sensitive root canal area and cause an infection, or in extreme circumstances, an abscess. An abscessed tooth is very serious and should be treated as an emergency, as it can create an infection that may spread to other parts of the body. If you believe you have an abscessed tooth, contact our office immediately to schedule emergency care. Depending on the case, root canal therapy may require more than one visit. An initial x-ray will be taken to evaluate the tooth and root canal and determine the extent of the damage and infection, if present. You will be given a form of anesthesia to make you relaxed. When the area is numb, our dentist will create an access chamber to the root canal using an electric hand-piece. Next, the infected or damaged tissue will be removed from the canal. Once the entire area has been thoroughly cleaned and polished, the tooth will be filled with a biocompatible rubber compound called gutta percha. The tooth is then covered with a dental filling or dental crown to restore strength and function. How are your root canals pain-free? One of our most exciting technologies is Rotary Endodontics. 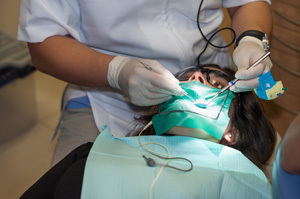 This advanced technique utilizes an electric hand-piece to perform the root canal, eliminating the drilling and scraping noise that makes many patients anxious. Combined with dental sedation and local anesthesia, you remain awake but relaxed throughout the procedure. The electric hand-piece also allows our dentists to perform root canals more quickly and precisely.